At some point yesterday Chocolate Chip-Gate began on Facebook. Word got out that Trader Joe’s popular kosher chocolate chips were being re-designated as “kosher dairy” rather than “kosher pareve”. Immediately, words like “tragic” and “devastating” were being used to describe the change. Facebook users were recounting their urgent visits to local Trader Joe’s locations to grab up the pareve (non-dairy) chocolate chips from the shelf in a way that brought back memories of Coca-Cola fans in the 1980s stockpiling cans of Coke when New Coke came out. Kosher consumers appreciate the pareve designation on chocolate chips because it allows for the substitution of non-dairy chocolate chips in baking for desserts following a meat meal, which is customary among most kosher-observant carnivores for Shabbat dinner. As soon as the news that Trader Joe’s would substitute the OK pareve hekhsher (kosher certification symbol) for a dairy one, discussion threads were launched on Facebook describing how favorite recipes for trail mix and chocolate chip challah would be an impossibility without the pareve chocolate chips from Trader Joe’s. An online petition was started to urge Trader Joe’s to reverse the decision. There was also a lot of misinformation about the change. 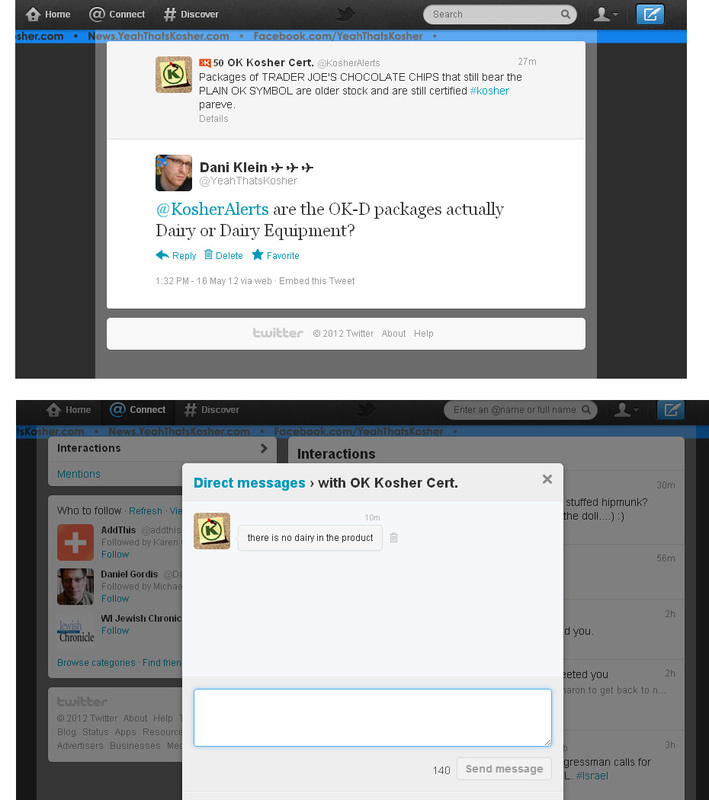 Dani Klein of the YeahThatsKosher blog posted a private Direct Message from Twitter that he received back from the OK Kosher Certification agency stating that the chocolate chips will not contain dairy, but will be labeled as such. There were also discussions that the new designation would actually be “DE” for dairy equipment, a relatively new kosher status that means the product is not dairy but the equipment could be used for dairy products. The Dairy Equipment designation means that food products with that status cannot be eaten with a meat meal, but can be eaten following that meal. The news that it would be a dairy equipment hekhsher and not a bona fide dairy label resulted in several discussions on Facebook about that designation, how food labeled with the DE should be treated, and what the ramifications of a DE label are for dairy allergic individuals who rely on a parevehekhsher for health reasons. Were people reacting too quickly? 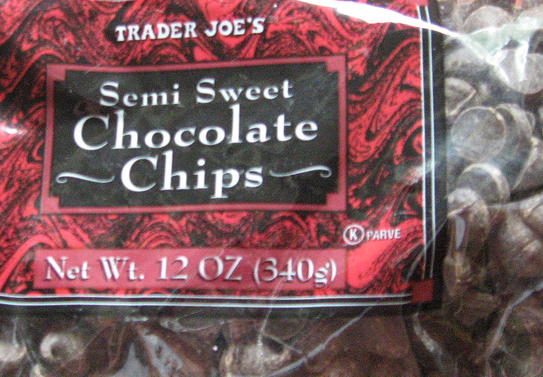 Was Trader Joe’s even changing the production process of the chocolate chips? Today, Dani Klein actually contacted the OK Kosher Certification Agency today and got to the bottom of this story. He was told that the chocolate chip product itself is not dairy, but the product is bagged at the end of the assembly line and neither Trader Joe’s or the OK Kosher Certification Agency can guarantee that dairy chocolate chips don’t also mix into the bag. This means that a bag of Trader Joe’s pareve chocolate chips may or may not have some dairy chips mixed into a bag. That is why the OK is taking the position that these bags of chocolate chips should bear the OK-D certification as if they were dairy. Further, Klein was told by OK officials that the response he received via Twitter was an error and should have been redacted. So, the bottom line is that the chocolate chips probably should have been labeled as “dairy” all along because they couldn’t guarantee no dairy chips were mixed in by accident (although if it’s less than 1/60th of the total volume of the bag it would still be pareve based on the principle of batel b’shishim). 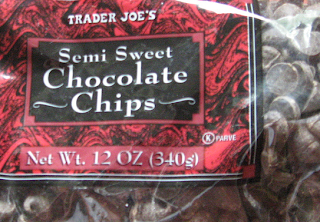 There are other pareve chocolate chips available on the market, but Chocolate Chip-Gate demonstrates just how much Trader Joe’s fans have come to rely on the market’s specialty products. While I am involved in the kosher certification industry through Kosher Michigan, this blog does not seek to set forth any kosher guidelines. Individuals should consult with their local rabbinic authority as to how they will treat Trader Joe’s kosher chocolate chips in the future. As a panelist for Jewish Values Online, I am asked to weigh in on various values-based questions from the perspective of a Conservative rabbi. A recent question I was asked to respond to was odd in that it wasn’t a question that had to do with values. I was asked to answer the difference between “glatt kosher” and “kosher”. This struck me as having to do less with values and more with a general misunderstanding. The term has come to mean “kosher to a higher level” leading many people to erroneously think that non-beef food items can be “glatt.” In fact, I have been asked if pizza that I certify as kosher is “glatt” to which I responded that if they’re concerned about the melted cheese atop the pizza being smooth, they should be fine. Most types of adhesion on the animal would make the animal a treifa and therefore forbidden to be eaten by a Jewish person. Rabbi Moshe Isserles (the Ramah) allows for a method of peeling and testing many types of adhesions, which results in many more animals being designated as kosher. This leniency allows kosher observant individuals to eat meat that is not from a “glatt” animal, but one whose adhesions had been checked through peeling and testing. Isserles ruled only for Ashkenazi Jews, but Rabbi Yosef Karo did not rule that this was acceptable practice and therefore his Sephardic followers only eat “glatt” kosher meat. This led to the “glatt” designation being considered a stringency that the pious would uphold. The misconception is that if meat is not “glatt” then it is not kosher. In truth, non-glatt meat that has been thoroughly inspected is considered fully kosher for Ashkenazic Jews. There are kosher certification agencies that only certify meat that is “glatt”. Those who only eat “glatt” meat are known as mehadrin, meaning “embellished.” Maintaining a kosher diet leaves froom for leniencies and stringencies. One who follows a more stringent level of kosher observance is considered to have embellished God’s commandments and thus is said to be keeping kosher l’mehadrin. The terms “glatt” and “mehadrin” have come to describe a higher level of kosher status, but has also been misapplied to such things as water. These terms can colloquially mean “extra strict supervision,” but it is important that the actual definition is lost along the way. Rabbi Reuven Hammer of Jerusalem has written about the fact that this stringency of the pious seems to apply to kosher food, but seldom to matters of ethics. He writes, “If people want to be extra strict with themselves, that is their right, but I often wonder why this extra strictness seems to be confined to ritual mitzvot rather than to ethical ones. Whenever I hear about Glatt I am reminded of [Rabbi Abraham Joshua] Heschel’s comment that we need a mashgiah [kosher supervisor] not just for food for other things such as lashon ha-ra – gossip – as well. SAN FRANCISCO (JTA) — The Conservative movement’s ethical kosher initiative may not have been intended as a wedge into the Orthodox monopoly over kosher supervision. But the planned rollout this summer of the Conservative-backed seal of ethical kosher production, the Magen Tzedek, coincides with an increase in the number of Conservative rabbis acting as kosher supervisors. “I see an uptick,” said Rabbi Paul Plotkin, chairman of the kashrut subcommittee of the Committee on Jewish Law and Standards, the legal body of the Conservative movement. At a time of growing activism in the Conservative movement around the issue of kashrut, the Conservative rabbinate seems to be moving into the kashrut business like never before. Conservative rabbis for years have been giving kosher supervision to their own synagogue kitchens, as well as to local caterers and retail establishments patronized by their congregations. 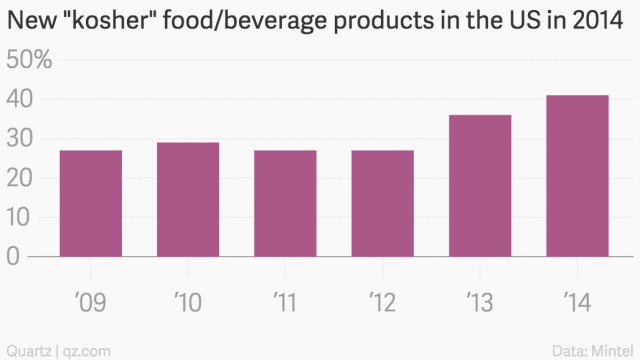 But they largely left commercial kosher supervision to the Orthodox. That’s beginning to change, say Conservative rabbis active in the field. 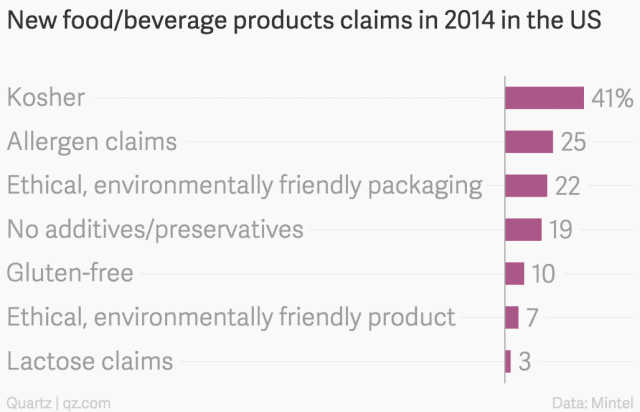 It’s partly due to the energy generated by the Magen Tzedek initiative, which will rate kosher food manufacturers according to prescribed standards of ethical behavior regarding workers, animals, the environment and financial dealings. It’s also a natural extension of Conservative interest in promoting kashrut, rabbis in the movement say. The Magen Tzedek is being tested at three kosher plants to see how well the auditing process works. Once testing concludes after Passover, those three manufacturers will go through the actual Magen Tzedek evaluation procedure, and the first kosher foods carrying the new seal should be on supermarket shelves before Rosh Hashanah, according to commission co-chair Rabbi Michael Siegel. The identity of the companies involved in the trial is being kept under wraps, but at least one is a “major food producer,” according to Rabbi Morris Allen, Magen Tzedek’s program director. Conservative Judaism, like Orthodoxy, accepts the Torah’s commandments as obligatory, including kashrut. While the same general laws of kashrut apply, there are some distinctions — notably the standards governing wine, cheese and certain fish. In recent years, Conservative kashrut certification has grown. 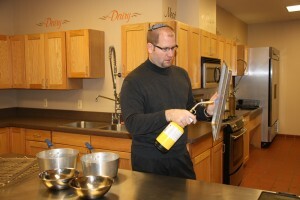 In 2008, Rabbi Jason Miller of Detroit founded Kosher Michigan, which certifies nearly 30 products and establishments. In addition to the bakeries and ice-cream parlors typically supervised by Conservative rabbis, Miller oversees a company that makes dried wheat used as an ingredient in other kosher products, and in March he opened the glatt kosher dining plan at Michigan State University. In Minneapolis-St. Paul, a group of Conservative rabbis launched MSP Kosher last July. Headed by Rabbi Avi Olitzky of Beth El Synagogue in St. Louis Park, the agency does not charge for its service, which Olitzky says is aimed at providing more kosher food for Jews who do not necessarily adhere to the stricter standards required by Orthodox supervision, such as glatt kosher meat. In the past two decades, Conservative rabbis have spearheaded lawsuits challenging a number of states’ kosher laws on the grounds that they constitute government interference in religious matters. In every case, the courts agreed that the existing laws indeed privileged Orthodox definitions of kashrut and overturned them. New kosher laws in those states only require that establishments advertising themselves as kosher disclose their kosher standards, not that they subscribe to Orthodox certification. “It’s a fair, nonsectarian way to acknowledge there are different approaches to kashrut,” said Rabbi Shalom Lewis, who was behind a recent case brought on his behalf in Atlanta by the American Civil Liberties Union. Orthodox reaction to these legal challenges has varied from shrugs to protestation. In New York and New Jersey, Orthodox rabbis in charge of enforcing the new laws say they do a disservice to kosher consumers who, the rabbis say, are interested only in Orthodox certification. In Georgia, Rabbi Reuven Stein, director of supervision of the Atlanta Kashruth Commission, said he was “disappointed” by Lewis’ lawsuit, calling it unnecessary and unhelpful. “Conservative rabbis do give hechsherim, and we’ve never had an issue with it,” he said, using the Hebrew word for kosher certification. Conservative leaders long have said that Magen Tzedek is not a replacement for Orthodox kosher certification, and only will be given to manufactured products already carrying a recognized kosher label, or to raw products such as fruits and vegetables that don’t need certification. Even so, the Magen Tzedek leadership characterizes its relationship with the Orthodox Union, whose label will appear on two of the three first products carrying the new ethical seal, as friendlier than the OU describes it. Rabbi Menachem Genack, CEO of the OU’s Kosher Division, stands by the position he articulated soon after the May 2008 immigration raid on the Agriprocessors kosher meatpacking plant. The Iowa plant’s demise pushed the Magen Tzedek project to the front burner of Conservative movement priorities. “We believe that all these important issues — the environment, workers’ rights and so on — are most effectively handled by government agencies that have the expertise and the mandate to monitor them,” Gernack told JTA. He said the OU was “dismayed” at Allen’s appearance on a recent episode of the TV show “American Greed” devoted to former Agriprocessors CEO Sholom Rubashkin, who is now serving a 27-year prison sentence for financial fraud. “The sentence is a travesty,” Genack said. That doesn’t mean the OU will hinder Magen Tzedek or any other additional certification a kosher food manufacturer might seek.